A point-and-shoot camera is a compact and easy to carry still camera specially designed for casual photographers. Its compactness, light weight, sophisticated design and ease of use make it a top choice among new photographers who are learning photography. Their features are easy to understand for beginners. Light in weight and compact and thus point-and-shoot cameras are easy to carry. Point-and-shoot cameras come under a reasonable price range and thus they are quite affordable. Preview of the scene on the LCD adds to the pleasure to shoot with ease and comfort. Semi manual and full manual controls are allowed in some cameras. Inferior quality of the image when compared to DSLRs. This is due to smaller size of optical image sensors of point-and-shoot cameras. Limited access to important manual features like aperture and shutter speed. Controlling these manual settings play a significant role in determining the overall quality of the image. So a Point-and-shoot camera usually comes down to its knees when it comes to controlling the manual settings. Point-and-shoot cameras suffer from shutter lags and thus they are prone to slow speeds. Inability to change the camera lens. They have a fixed inbuilt camera lens which can’t be replaced. point and shoot camera uses autofocus lenses or focus free lenses which means you are not allowed to change the focal length of these cameras such as the earlier used film cameras which uses a film to store the projected image. But with the advancement in technology point and shoot cameras changed their mechanism. Now they use a sensor on which image is projected and it is stored in memory devices. The point and shoot camera’s are now bit flexible and their controls such as shutter speed, aperture etc. can now be altered to some extent. Should I buy a point and shoot camera? If you don’t use a camera on regular basis then it is a better choice for you. For the people who use cameras only on special occasions such as a family party or a picnic then you should go for point and shoot camera.It is easier to maintain and differs with large gap in price as compared to DSLR. It is built for those who don’t want to tangle in complex operations of DSLR. A DSLR is complicated when compared to a point-and-shoot camera. 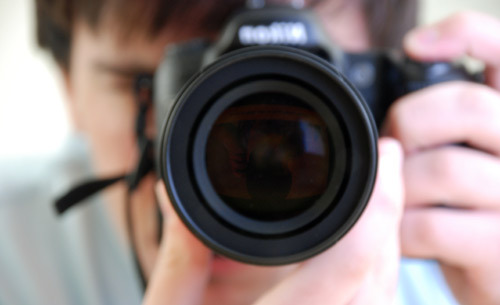 DSLRs use a reflex mirror system to aid the photographer to view through the optical view-finder. It is a camera especially designed for professionals who need a wide range of accuracy as well as a wide range of flexibility in their work. By flexibility I mean effortless access to all the manual settings like controlling aperture, shutter speed, ISO, etc..
DSLRs have totally different working system as compared to point and shoot cameras. The DSLR cameras has a lens, a mirror system and a pentaprism. They use mirror to reflect light to the viewfinder with the help of a pentaprism. A pentaprism is prism having five sides and is used to deviate the beam of light coming from the lens after the reflection from mirror by 90 degree so that conveyance of image by right angle without any inversion. Total internal reflection takes place inside the pentaprism to focus the view of image just composed to the viewfinder. A viewfinder is what photographer looks through to compose a image.The LED, LCD and OLED are electronic viewfinder. And the lens is used with camera body to project the image on sensor which stores the image electrically. A simple model of a DSLR will help you to understand this better. Superior image quality owing to comparatively larger size of optical image sensor of a DSLR camera. Access to a wide range of manual control/settings and thus DSLRs are flexible devices. Photographers enjoy the freedom to select several manual settings with the comfort of just a few clicks. These days DSLRs come with interchangeable camera lens. This feature adds to their reliability and ease of use. Optical view finder adds to the sheer photography experience. DSLRs are bulky and complicated devices. Unlike a point-and-shoot camera, a DSLR is difficult to carry everywhere with the comfort of putting it in your pocket. DSLRs are much expensive when compared to point-and-shoot cameras. Thus it is recommended only for people who take photography as a career or photographers who are very much skilled in this business. DSLRs are very difficult to maintain. Great care has to be ensured to get it working in excellent condition. Should i buy a DSLR? If you are a serious photographer and have a keen interest in photography then DSLR is a right choice for you because it gives you wide features which point and shoot cameras are incapable of providing. Photography is all about experimenting with new things and a DSLR camera gives you boundless flexibility to experiment with new things. If you are not a regular photographer and don’t want to alter the controls of a camera rather loves to shoot in Auto mode then DSLR is not what you are searching for. If you are opting for a DSLR then keep it in mind that it is quite expensive and it is not a one time payment product. You may need to purchase different lenses lenses in future which are expensive too. But in a nutshell, the image quality of a DSLR cannot be compared to that of a point-and-shoot camera. Please don't forget to confirm your subscription by checking your email!